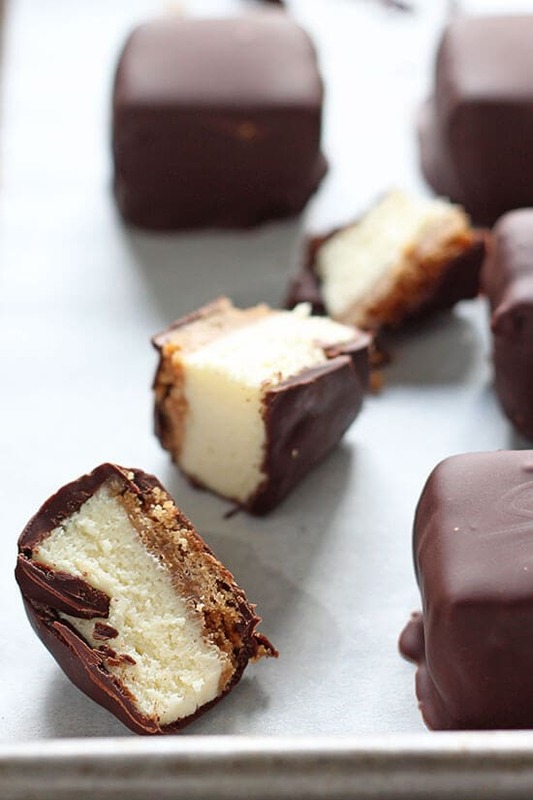 Chocolate Covered Cheesecake Bites are the ultimate party food – nothing can beat this rich and flavorful bite-sized dessert. Be warned: these won’t last! Taste: The tangy cheesecake paired with the sweet chocolate is a perfect match. Texture: Just wow. Buttery crunchy graham cracker crust + thick, luscious and rich cheesecake + thin snappy chocolate coating = bliss. Ease: Super easy, just a bit messy and requires some patience. Pros: Fun bite-sized twist on a classic dessert. These will be gone in about 5 seconds flat at any party. Would I make this again? I’ve made this recipe multiple times! Oh boy do I have a treat for you today. I’ve basically taken one of the most beloved desserts and turned it into candy! I love that I get to do such things for my job. It rarely feels like work, only when I have to do dishes a billion times a day. These cheesecake bites were actually the very first baking recipe I tested out in our new kitchen! Even though our new kitchen is smaller, I find it to be much more functional. I don’t have to pace ten steps just to reach the sink anymore (our old kitchen was very wide and open). It actually kind of reminds me of our little work stations in culinary school! Sometimes smaller is better, just like with these cheesecake bites! Who doesn’t love cheesecake? It’s even better when it’s bite-sized and covered in chocolate! 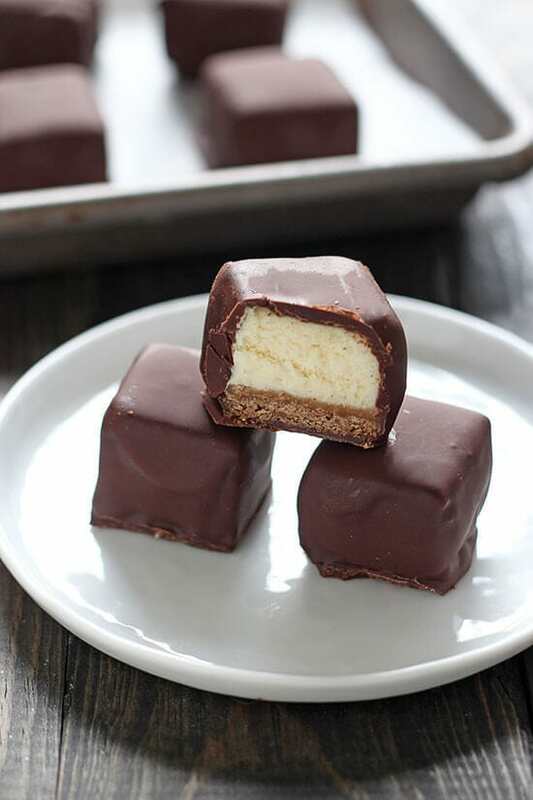 These popable Chocolate Covered Cheesecake Bites are the perfect party food for any occasion. They’re positively addicting and will vanish in about 2 seconds flat. 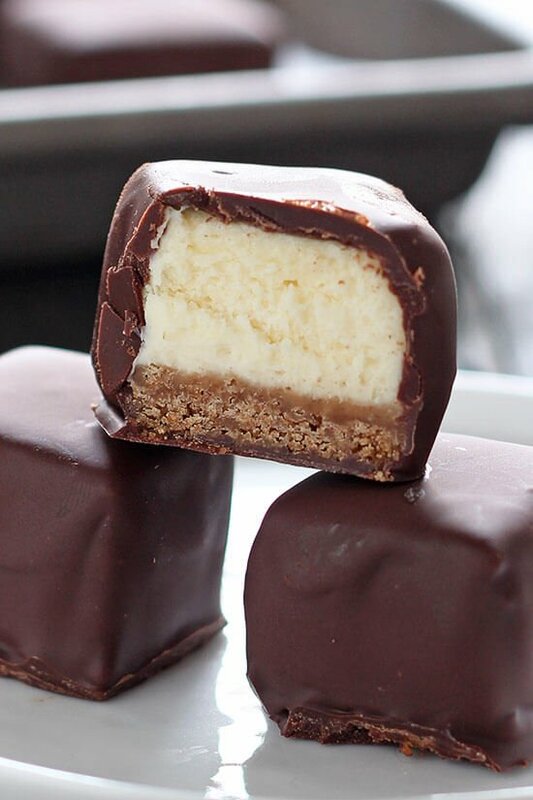 I love that you can’t tell what’s inside, they look like a regular ole’ chocolate bite or bonbon type of dessert but the homemade cheesecake is such a fun surprise! The combination of flavors and textures is fantastic. By the way, the crust in this recipe is VERY buttery so it stays cohesive and doesn’t crumble as you dip the bites in the chocolate. Also, make sure your bites are as cold as possible before dipping for best results! The key to beautiful, easy-to-dip bites is to make sure they’re as cold as possible. If they warm up too much pop them back in the freezer until they’re firm and frozen again. Preheat oven to 350 degrees F. Line an 8 by 8-inch square baking dish with foil and spray with non-stick cooking spray. In a small bowl combine graham cracker crumbs and butter. Press mixture evenly into prepared pan. Bake for 10 minutes, or until light golden and fragrant. Reduce heat to 325°F. Using an electric mixer, beat the cream cheese and sugar until smooth and fluffy, about 3 minutes. On low speed, add in the sour cream, eggs, vanilla, flour, and salt and beat until just combined. Be careful not to overmix. Pour the batter over the crust and bake for 35 to 40 minutes, or until cheesecake is slightly puffed and center is set. If the center is slightly jiggly, that’s fine. Let cool completely on a wire rack. Freeze for 3 hours, or until very cold and firm, or overnight. Once frozen, lift cheesecake out of pan and gently peel away foil. 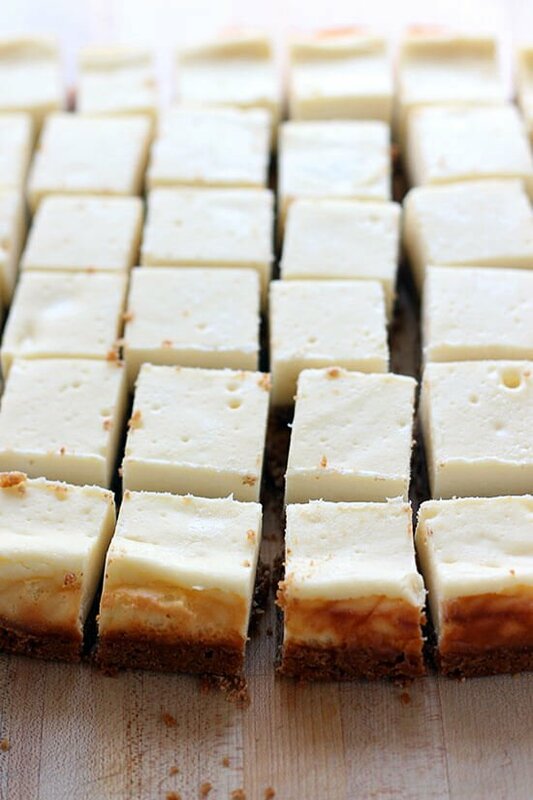 Using a sharp knife, cut cheesecake into 36 bite-size squares. If squares become too soft, freeze until chilled again. Place the chocolate and coconut oil in a microwave-safe bowl and heat for 1 to 2 minutes, stirring every 30 seconds, until melted and smooth. Place parchment paper or a silicone baking mat on a baking sheet. 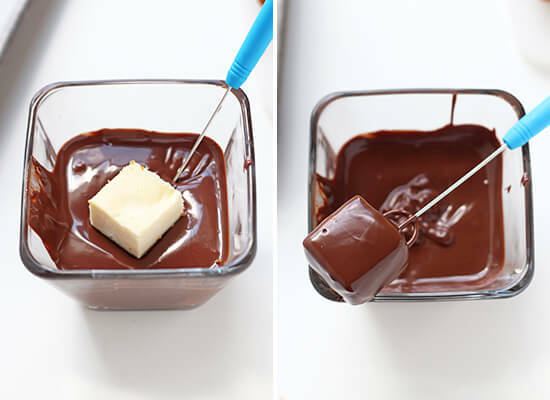 Dip cheesecake squares, one at a time, in the melted chocolate. Let the excess drip off and place on prepared sheet. Repeat for all the squares then refrigerate until the chocolate is set. Serve or store the squares in an airtight container in the fridge or freezer. Thank you so much, Tessa! These are the ‘perfect’ dessert for me! Printed this recipe out and it’s on my ‘to-make’ list. YUM!! This is such a great idea! I can only imagine how delicious these cheesecake bites are! Pinned! I’m loving mini desserts right now! I feel much less guilty eating three or four mini cheesecake bites than a whole slice sometimes. These look so good, I probably wouldn’t be able to stop at just one! Hi! Do u have a grams conversion for this recipe? I would really love to try out this lovely recipe! Thank you! You’re killing me with these cheesecake bites! I’m drooling!!! Could I use plain nonfat greek yogurt in place of the sour cream? So I was in a hurry and didn’t read the directions as I went…. Is it really bad if it’s over mixed? I just finished making it. Finally done. But it didn’t come out as nice as Tessa’s. But it’s delicious. I can’t wait to make these! Is there an appropriate substitute for the coconut oil? I don’t usually have it around the kitchen. Thanks! Coconut oil is really the best because it allows the chocolate to harden beautifully. The best substitute would be shortening. I used chocolate flavored bark coating, it is located in the baking isle. I worked amazing it also works really well on strawberries! These look fantastic! I have a question. The graham crackers I buy come in sleeves as individual crackers, but I think they sometimes come in “sheets” with several crackers stuck together. Do you mean 9 sheets, or 9 individual crackers? These look so yummy! I want to make them but am allergic to coconut. Is there something I can use to substitute for coconut oil? Coconut oil is the best but you can use shortening. I have graham cracker crumbs already….how much of it do we need to use to combine with the 4 oz of butter? I made these and they taste delicious. The cheesecake is the most important part, and it is moist and rich and tangy and just plain yummy. The chocolate coating came out perfectly. My only change was in the dipping. After the first couple of tries with the fork, I decided to just hold them by the crust and dip the tops. Who sees the bottoms anyway. Came out perfect, saved me time and effort too. Needless to say, I think I ( or should I say we, lol) are gonna win the Chelsea MEC employee bake-off this year! I’ll give you most of the credit, Tessa – promise. Thanks! Awesome, Deb! Glad you were able to make the recipe your own 🙂 Good luck, hope you win!! I’m making these later today. So excited! I made these for the company dessert contest and they won! Everyone loved them. Does this double easily- using a 9×13 pan? I love love love this recipe. Have made it twice already and am planning on making it a third time this weekend. I have had trouble dipping the cheesecake and coating the chocolate evenly without making a mess, so like an above comment, I have been just dipping them by holding the bottoms. Any suggestions? It says 9 whole graham cracker’s , but the says crumbs, how many cups of crumbs would that be? I am going to make these, they look delicious! I have a question, what type of sour cream did you use? There are a lot of types of cream in my country and I don’t want to use the wrong one. Just standard sour cream, that’s about all we have here! These look delicious. I was wondering if regular table salt can be used in place of sea salt and if so how much? Thank you! Hi, can I use normal cream instead of sour cream? I haven’t tried that, but if you give it a go you may want to use just slightly less so as not to create too thin of a batter. I think I could eat these by the fistfuls!! Great recipe! Hi Tessa – I had a major problem with these. Trying to convince people that I had made them and not shop bought – they were absolutely delicious. 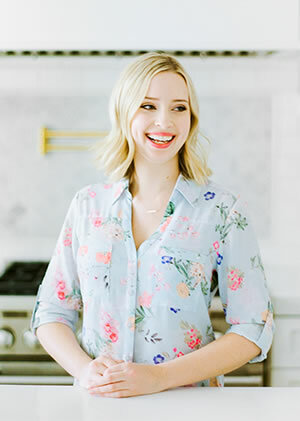 Thank you so much Tessa for all your recipes. Thank you so much for this wonderful recipe! I’m picky about cheesecake, but this one was perfectly creamy and had a great ratio of crust to filling. I omitted the flour (accidentally) and halved the amount of butter in the crust — the filling and crust set up perfectly with these changes so I’ll probably make it that way from now on. I was too lazy to coat them in chocolate so I drizzled a bunch of melted chocolate (and sprinkled mini chocolate chips) on half the batch (the rest I left plain). After an hour in the freezer, they were set-up enough to wrap individually in plastic wrap. My family has been eating one (or 5) a day for dessert! Hello, I would like to make ahead and freeze. Any suggestions? instead of coconut oil can i use canola oil? What is that handy little blue tool you use to dip the cheesecake with? These were very easy to make. When I saw that it was a 8×8 pan I thought it wouldn’t be enough. It was plenty. I dipped cheesecake part only. It was easier to handle. Took them to a party today. Got rave reviews. I loved them frozen. Yum, yum, yum! Hey there! I am wanting to do a white chocolate coating, will the ratio of coconut oil to chips ratio be the same? these are really good. the coconut oil really helps the chocolate garden quickly. you can taste it in the finished product, but it’s not overwhelming. i wish i could post a picture, because they are so pretty! sorry … the comment above is supposed to say “really helps then coconut harden”, NOT garden! 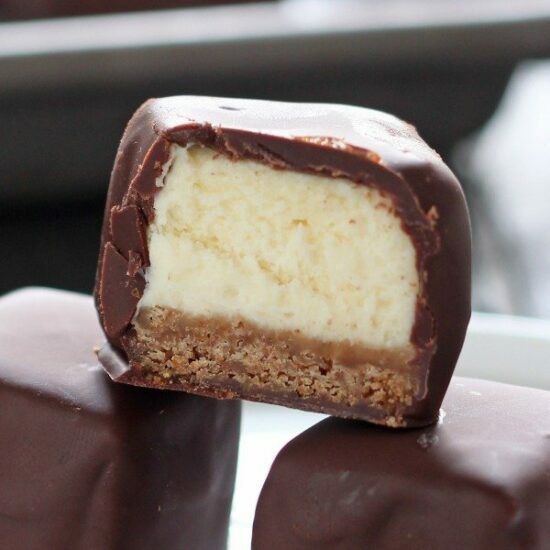 Can I use your chocolate cheesecake recipe to make chocolate cheesecake bites? If so, does it still need to be on a water bath? If you’re making cheesecake bites, then you don’t need to bother with a water bath since you’ll be slicing them up anyways! I just made these and I had a mess. I would NOT make them again. I had to keep half of the bites in the freezer while trying to work with the other half before they got too soft to dip. After dipping about 40 of them, I gave up and smashed them back into the bottom of the pan and poured the chocolate over the top. Hi Tessa,love all your recipes….you make it so simple for us….made these today, how ever my cheesecake turned out very salty and I’m wondering why…..I followed the recipe to the T….I used regular table salt as I did not have sea salt…. Further I used melted Belgian chocolate chips and added coconut oil…..my chocolate was melting( coating the fingers) within seconds of being out of the fridge. Hi Tessa,waiting to hear from you on my comment above.Please advise. Hi Tessa,do advise on my comment above.Thanks. Tessa… Really would like some guidance like others on what 9 graham crackers are… Even a dimension of each would help. Thanks! I made these for x-mas and everybody loved them! I actually made 2 batches because I had to throw away the 1st batch after they got left out of the freezer all night and day (unbeknownst to me).Kind of a blessing in disguise because the first batch tasted like sawdust! I had used Walmart brand cream cheese and it turns out that Great Value brand cream cheese tastes absolutely disgusting (avoid at all cost people!). The 2nd time I used the Philadelphia brand (i could not believe the difference in taste!) and added 3 tbs of sugar to the crust. I also had a pan of water in the bottom of the oven (i didn’t want to do a *real* waterbath). It turned out really good (super tasty and creamy). The addition of coconut oil to the chocolate works great–doesn’t mess with the taste at all! How do you freeze this? You let the cheesecake set than freeze in foil? Super easy!! Delicious!! This is definitely a keeper! !